Traditional in Manaus, Novotel has a privileged location in the Industrial district, close to the main sights, such as Teatro Amazonas and the historical center. It has comfortable rooms and complete infrastructure for your holiday or business trip, swimming pool, soccer field, tennis courts, jogging track, kids space, barbecue area, gym, function rooms, WiFi. The hotel is 20km from the Airport. Manaus is the northern region's main financial and economic center due to its Industrial Zone. With its culture and natural beauty, including the Amazonas Theater and the Meeting of Waters, it is also one of the main tourist destinations in Amazonia. Suite with 50m², 1 king size bed and 1 sofa bed ideal for the family. Restaurant 365 has been totally renovated and offers a buffet breakfast and lunch and a la carte dinner. On Saturdays it hosts the traditional and most famous Feijoada in the city, with live music and a full buffet. Bar 365 in the NOVOTEL Manaus has been totally renovated and is the ideal place to unwind after a day at work, with ambient music and a range of snacks and drinks. 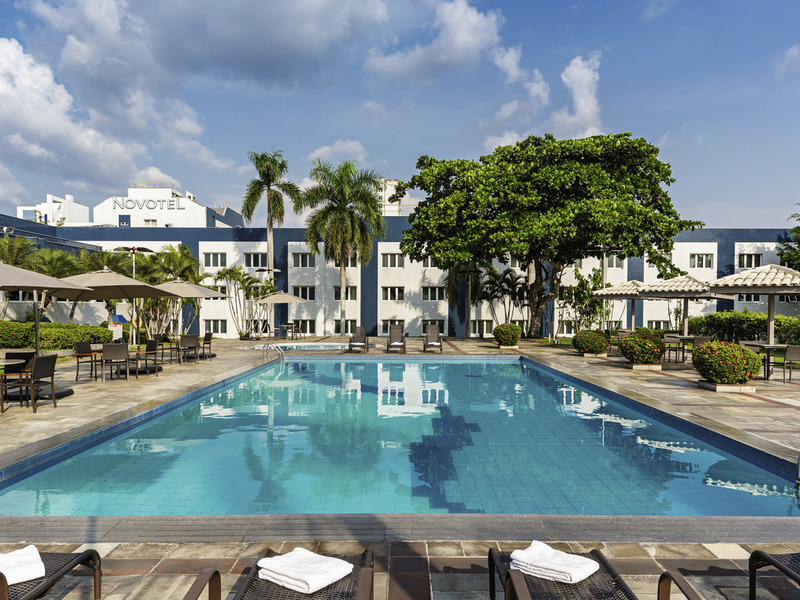 Among the hotels in the area, Novotel Manaus defenitely is the better choice. - Nice rooms - Good food (Breakfast and Dinnter) - People (Polite) - Internet - that is the only problem I had this time, for some reason it was very unstable. Thalita at the receptionin the afternoon is your best reception person of all including the “manager”. She is caring, calm and collected and very knowledgeable and resoursful. Food in the buffet is mediocre for a 4* hotel relatively far from other eating options. Sonja P.
My time at Novotel was amazing! I was treated as if I were the only person in the hotel. The staff is what makes my stay worth coming back time and time again. I especially was impressed with Vivianne as she was very loving, friendly, and answered any questions I may have had. She always makes my wife and I feel very special and at home! I’m also very thankful for Juao Bosco, Gil, Petronio, and Fernando who are always so welcoming and are so attentive to all our needs. Novotel is the best! Very nice and professional staff, good breakfast and restaurant, nice swimming pool, well equipped gym. I had a great time at Novotel! We were received by a wonderful receptionist called Vivi who now became a friend of mine! I absolutely love their breakfast, you can find anything there, but the detox drink they serve is the best! The dinner was delicious and I was very appreciative of João Bosco who you can see does his job with all his heart. The workers are always super nice and doing everything they can for us to have a good time! Their swimming pool is big and always clean, they have a nice gym and beautiful and comfortable rooms. I will always recommend Novotel, you can’t go wrong with this choice! The hotel has a very strong smell, specially in the 1st floor where I stayed. The breakfast was really good. The bed was comfortable. The service at the restaurant at the night was really slow. I didn't like to know that my other collegues stayed in a better floor, where the rooms do not have a bathtub to take a simple shower which I do not consider clean. hotel is OK, however expensive for what it offers. room was not clean: floor is dirty, bathroom had hairs which were not mine. quite disgusting. very noisy during the night, what woke me up during the two nights i spent there. worst of all, shampoo and conditioning were expired! threw them away, the next day the replacements were also expired - back from 2017!!! took some pictures, sent to management, talked to the front desk, never received an answer. quite bad. if i had the time, i would go to the local authorities as this is a crime. Best Hotel I've ever been to! The best hotel I’ve ever been at! You can’t go wrong going to Novotel, I am so serious!! I had an amazing experience at Novotel, it’s for sure the best hotel I’ve ever been at and I will never get tired of going back! The food was delicious, the breakfast was perfect, they make the best tapioca and they have a very healthy detox drink that I love! The room was great, nice and clean! But the best things of all was the workers, we got out of there with many friends! They are the sweetest, most caring and polite people! They go out of their way to make things special for their guests, we love them and miss them, it was sad to leave, I wish I could live there! I felt totally at home with them, don’t even think twice, choose Novotel!!! I did not have any problems in my staying at Novotel . The staff were great and food amazing. Definetly It's a great hotel . The room was nice. It was clean and had everything you needed. But the service in the hotel is very unfriendly. The people in the front desk did not smile and made us feel unwelcome. Seemed like the staff didn’t want to talk with us at all at check in or check out. Also very annoying that there were 3 times people had been knocking on our door in the morning, before 10 am. First someone wanted to check the air condition, second time a person wanted to get our laundry (which we didn’t have) and then a guy who wanted to check our mini bar. Luckily we woke up early, otherwise we would have been awaken by the guys trying to come into our room at 8 am. WAY TOO EARLY. The only people who seemed nice, were the people working in the restaurant. Prezado Magno, Obrigado por dividir sua opinião com a gente! Lamentamos muito que sua experiência não tenha atendido às expectativas. Suas observações serão consideradas com a devida atenção. No Novotel Manaus, procuramos oferecer um serviço de alto nível a cada um de nossos clientes; por isso seu feedback é muito importante para nós. Atenciosamente, Daniel Betiol Gerente Geral Novotel Manaus www.novotel.com Faça sua reserva em nosso site e confira as vantagens. We loved the lobby are ones we walked in but We were very disappointed with our room that smelled terribly bad! The buffet wasn’t clean! There was flies and plates on the display werent clean, we had to order from the menu; some of the staff were friendly! entrance and service was so nice, internet link is very poor and i have 2 days without any connection more than 1 hours, lunch and breakfast so nice.